KOKOMO, Ind. – Overseas study can have the greatest impact on students' collegiate experiences and life. Many students who travel overseas claim the trips are life changing. 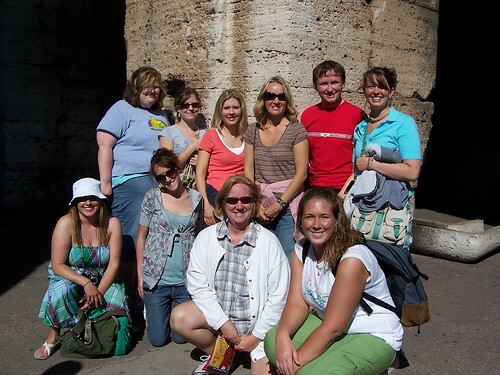 Donna McLean and Minda Douglas lead a group of students on a previous trip to Italy.Fortunately, for students at Indiana University Kokomo, there are multiple overseas study opportunities. Currently, faculty members Donna McLean and Minda Douglas are gearing up for an overseas study trip to Italy slated for March 2013. McLean and Douglas anticipate this trip will give students the "travel bug," which helps build confidence to pursue international travel in the future. Ultimately, they want students to challenge themselves and step outside their comfort zone. "Italy can really change your perspective on a lot of things, and allow you to grow in new ways," McLean said. "It's always fun to watch the students have new experiences and build new relationships that will last a lifetime." McLean, associate professor of communication arts, and Douglas, assistant professor of fine arts, have designed courses focusing on art, communication, culture, and travel to Italy. Students can take one of two classes during the spring semester, S302 Rhetoric and Society: Italian Culture and Communication or A200 Topics in Art History: Foreign Study in Italian Art. The courses are offered on Tuesday evenings from 5:30 to 8:30 p.m.
McLean is looking forward to taking students on the trip for the third time. "Italy is a place that can capture student's imaginations," she said. "It's a great opportunity to see and do things that we've been fascinated with since we were young." There are spots available for six more students to travel to Italy, and interested students should contact McLean or Douglas as soon as possible. Students have until December 7 to register for the course and pay a travel deposit. The cost is about $3,500, which includes airfare, three-star hotel with breakfast each day, all in-country transportation, and all site and admission fees. In addition, students should plan to bring $500 for spending money. Overseas study scholarships are available to all students who register for either course. There are 14 scholarships at $500 each and four scholarships at $1000 each, available to students who meet the criteria. Fundraising will continue through the beginning of the spring semester. The trip will be 10 days long, and students will travel to Rome, Pompeii, and Florence to understand historical works by Leonardo da Vinci and Michelangelo and important communicators, such as Cicero and Mussolini. McLean and Douglas chose spring break so that students will learn about what they will see in Italy, the ability to see a lot of sites, and the nice weather. "Traveling as a group allows us to see quite a bit in a short period of time, and we appreciate the sites so much more once we have read and researched them ahead of time," McLean said. The course is built so that students can learn from each other, with students in the art course giving presentations to the students in the culture and communication course and vise versa. Either of these courses fit in as a great elective for communication, humanities, education, or fine arts students, but any student is encouraged to attend. When students return from the trip, they hope to have photos displayed around campus, as well as having a photo contest. In addition, there are plans for the students to assist with International Day, where the International School in Kokomo comes in for a day of service learning. For further information, contact McLean, domclean@iuk.edu, or Douglas, mimdougl@iuk.edu. Story written by Mary Olk, a senior majoring in communication arts. She works in the Office of Media and Marketing.